Late last year I finished reading the 10 book epic: “Malazan: Book of the Fallen” by Steven Erikson. It remains strong in my mind. Each book is thick, complicated and long winded…yet I say all such in a good way. It took a few attempts to get through the first one. I tried to read in my usual way of one of several books at once, dipping in and dipping out. That failed. Malazan requires all your attention. Focus. Malazan needs to be read all the way through; solidly. When I did finally complete the first one, it was by reading for an hour or so a night, every night. For the first few books, I averaged one a year. By the end, I think I read the last 3 straight through, one after the other. 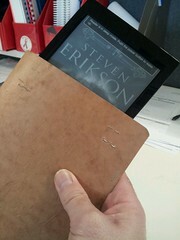 Malazan requires that devotion. In hindsight, it would have been better to have read each, one after the other, straight through…around 12-15,000 densely packed pages. There are multiple story arcs, lots of major characters, minor characters who occasionally become major, and a world view that is deep, complicated and satisfying. I have the first 5 in thick, chunky paperbacks, and volumes 5-10 in ebook. For me they worked best as e, as in p they were thick and heavy. In e, they went with me everywhere and were read in every spare moment I could grasp. Unfortunately, I have missed them both. Though, I could have bought the latter at least, which would have meant I could have bought the rest with the same book number in limited edition. I was tempted by the lettered edition too ($150 vs $300 I think). However, stupidly, I tried to track down a copy of the first so that I could get number consistency. I failed to get the first and have now missed out on the second. Number consistency while nice, is ultimately a silly thing. Instead, I’m now looking for regular hardcovers, including first editions. Initial searches suggest they’ll be easier to come by. I’ve already found 3: $60 for unsigned and $125 for signed. It’s interesting that for the first few books at least, the first hardcover is US based. Whereas the first printing was in the UK, where the author resides, and in trade paperback not hardcover. I remain tempted to read them all again: one after the other.